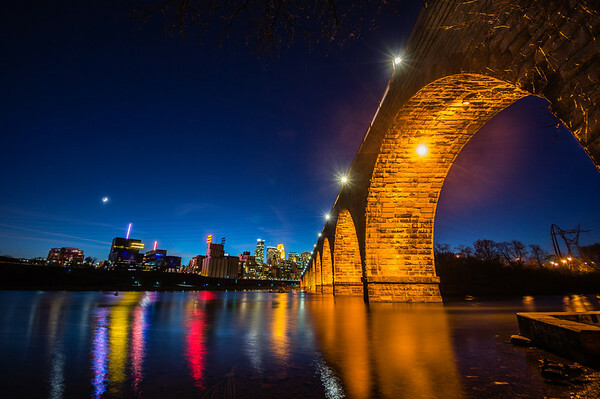 Minneapolis lights reflect on the river next to the Stone Arch bridge. 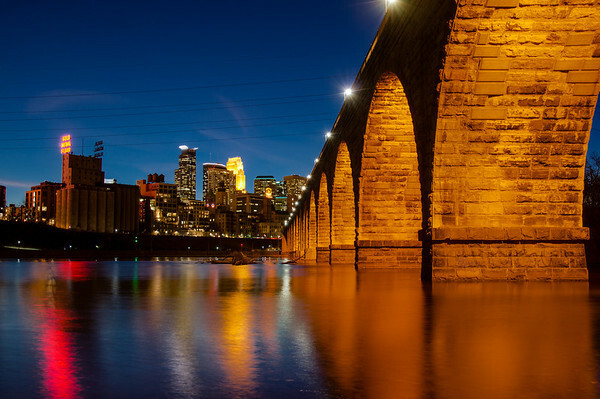 Minneapolis is also known as the mill city for the mills that used to adorn the river. On the far side of the Mississippi River you can see Gold Medal Flour and next door is the Mill City Museum. To the right is the Stone Arch bridge which is often photographed. This spot is extremely popular and often when there is a NFL or other pro sports game they’ll have a shot from this spot. Here I used an ultra wide angle to get more of the 1st arch then a lot of photos capture. See more of Minneapolis here. Whenever the moon is in an HDR photo like the first one I’m always careful to capture it with a fast enough shutter speed. I wanted the shape of the moon here without having a white blob. If using Photomatix you can mark the moon as ghosted and choose the proper exposure. It did a good job but I still went into Photoshop to touch it up a bit. They’re both nice, but I prefer the second photo: the cropping there is better, leaving out the uninteresting part on the right side of the bridge. Thanks Cardinal for the feedback. The second one is the usual framing for that location. I was trying to get a little different view in the first photo although I see your point. I definitely need to return to that spot soon!